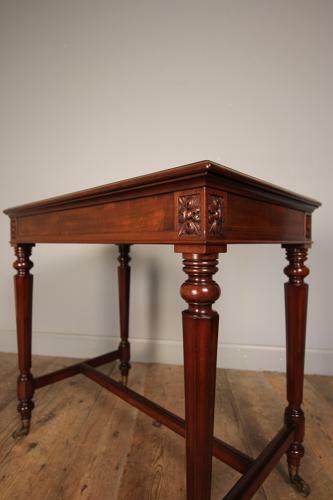 A fine and well proportioned Mahogany side table attributed to Gillows of London & Lancaster. Having a moulded top, panelled and polished to all 4 sides making work equally well in the middle of a room or against a wall. Raised on turned and tapering hexagonal legs, terminating in the original high quality brass cup castors by Cope & Collinson. Super colour and original condition throughout. English, Circa 1835.